All sounds from OSU’s experimental swamp (aka The Wilma H. Schiermeier Olentangy River Wetland Research Park) just before dawn on May 23rd, 2015. The birds and trains are [s]lower, but otherwise heard as they were. TradeMark Gunderson is a musician and technology artist out to remix the world. Decades of work produced under the band name of The Evolution Control Committee helped pioneer the mashup world of cut-n-paste music. It also challenged the role of copyright in an emerging digital world, making him a target of legal threats from mass media companies and rejection by music pressers and distributors. TradeMark is also the inventor/hacker of devices like the Thimbletron and the VidiMasher 3000, digital music instruments created specifically to perform his unique sounds. TradeMark and The ECC have appeared on networks from CNN to C-SPAN, in print from Spin Magazine to the Macmillan Dictionary, and in person giving around 1,000 performances and presentations at festivals, concert halls, bars, and galleries all over the world. TradeMark received his MFA from The Ohio State University where he currently teaches new media art. 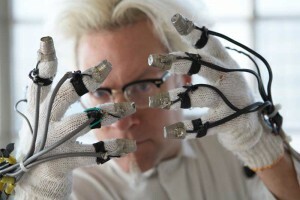 He is also the recipient of an Ohio Arts Council Media Arts Fellowship Grant, an artist-in-residence and visiting alumni at the Headlands Center for the Arts, the recipient of three sound art commissions from the Burning Man festival, and the co-founder of five other bands and at least three radio stations.